As part of the Tech Club’s goal of creating opportunities for students to further develop their “hard skills” through practical learning experiences, we’ve recently been hosting weekly Code & Coffee sessions. We had our first meeting two weeks ago, and it was a great success as we crushed code and rocked out to “Don’t Stop Believing” Pandora radio. These meetings are primarily designed to promote a collaborative learning experience for those trying to learn programming. Instead of individuals tackling it on their own, the idea is to create an environment where students can seek help from each other as they move through the same curriculum. The sessions are essentially structured as a self-directed study group that meets on a weekly basis to go through a set curriculum together. The curriculum we’ve been following is the Python tutorial on Codecademy. Python is a great introductory coding language due to its heavy emphasis on readability. It also appears to be the language of choice among data scientists. The Codecademy platform is highly interactive and especially intuitive / user-friendly for beginner programmers. The entire tutorial only takes about 13 hours to complete, and we’ve already made solid progress during our last two sessions. 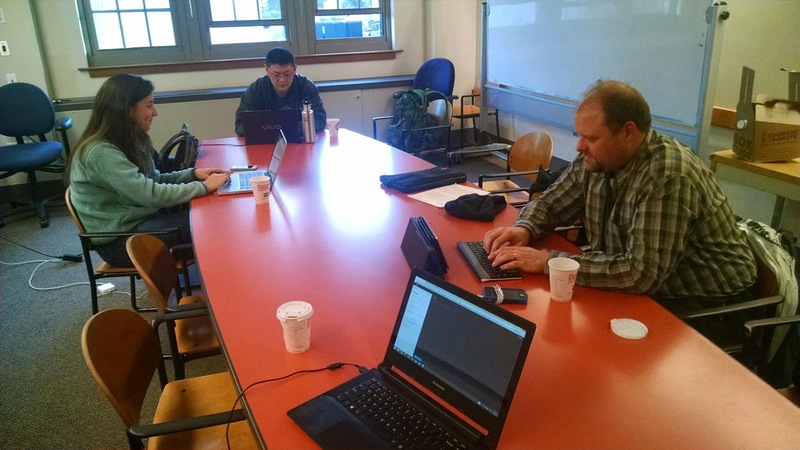 Grad Techers getting their code and coffee on! Setting aside a weekly meeting time is also intended to maintain a higher level of discipline when it comes developing these hard skills. From my own personal experience of attempting to teach myself programming through an online course, I’ve struggled to keep up with it. Something more important or pressing always seems to come up—it’s so easy to push off going through that next online lecture or exercise without a set schedule. We’re hoping that working alongside others in a collaborative group setting that meets regularly should make it easier (and hopefully more enjoyable!) to keep up with the material. Once a group of us is able to develop a decent comfort level with Python, the longer term goal of these sessions is to work on a Kaggle project together to really put our skills to the test. Kaggle is a platform for predictive modeling and analytics competitions on which companies and researchers post their data and then data miners/statisticians compete to produce the best model (essentially the data science version of TopCoder). Tackling one of these real-life projects would provide a great opportunity to practically apply the skills we develop. We’re hoping that interested students will take advantage of the opportunity to develop their technical “hard skills” to supplement the conceptual material and softer skills of BC’s MBA program. Join us on Friday afternoons at 2:30pm—if not for the coding, then at least for the free coffee, good music and good company! What better way to spend a Friday afternoon? Also all levels of programming experience are welcome! In fact, advanced programmers are particularly encouraged to attend. If you have any other projects you’re working on using languages other than Python, please don’t feel restricted at all – this group is truly designed to learn and collaborate as much as possible. If you have any suggestions for our group, please don’t hesitate to let me know. These sessions are definitely a work-in-progress! Email kenersko@bc.edu for any questions, suggestions, etc.